Long-time Green organizer Bob Long passed away on January 27, 2010 at the age of 92. Especially active in the early years of the U.S. Green movement, Long played two particularly critical roles in its development. His calm manner, steady demeanor and personal stature provided a stable foundation and touchstone for formative Green organizing in the 1980s and early 1990s, especially in Southern California where he lived at the time. His commitment to spreading Green ideas through print and radio helped provide a theoretical and practical base to the growing Green movement, which was in the early stages of defining itself at that time. But Longís political activism predated the Green movement by decades. He began in the 1940s battling for social justice. Always envisioning a better world, his desire that all workers be treated fairly led to his joining the Socialist Labor Party (SLP). Working as a research chemist during World War II at Union Oil, he refused to be a “scab” or cross the picket line when the refinery workers went on strike. He was fired for insubordination but took his case to the National Labor Relations Board and won with the help of the oil workers union, forcing the company to rehire him. Then in 1946 he ran for Governor of California on the SLP ticket against incumbent Earl Warren — another uphill fight, considering Warren ran on the Republican, Democratic and Progressive ballot lines and received 91.6% of the vote. 1946 was not a total loss however, as Long married Helen Pashcanoff on March 16. Deciding that being an oil company researcher was not for him, Long applied for a job and was accepted as professor of chemistry at El Camino Junior College in 1950. Then in 1952 at the height of the McCarthy era — a dark time for liberal professors — he resigned his professorship and moved with Helen to a farm they bought in southern Indiana in partnership with his brother Gordon. They farmed there for four years, but the first winter they didnít have indoor plumbing (they installed it a year later) and had to watch the diapers of their newborn daughter Kathy freeze on the clothesline. Then Helen put her foot down and insisted that the family move back to Southern California. Long was immediately rehired at El Camino, where he remained a professor of chemistry until his retirement in 1982. Bob and Helen stayed active in the SLP until 1969, when both resigned because “they did not want to knuckle under to the whims of the party leadership.” In a letter to brother Gordon in May 1969 Long wrote: There is a small but determined minority in the SLP that is breaking away and will seek to establish an organization that will be democratic and scientific and in tune with the times.” A small group formed and called themselves Socialist Reconstruction and held meetings in Ann Arbor, Michigan in 1970, which Bob and Helen attended. 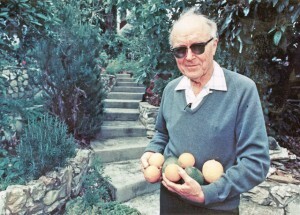 The group didnít hold together too long, but afterwards Bob helped co-found The League for Economic Democracy (LED) in Southern California. “SYNTHESIS hopes it will be able to add to the effectiveness of the rather diffuse worldwide movement to build non-authoritarian societiesÖWe address ourselves to those who agree that the bureaucratism and authoritarianism both of the capitalist societies and the so-called socialist or communist world must be replaced with a free association of producers and citizens. But the question must be asked whether the movement for a non-authoritarian society is at all capable of coping with either the organization and zeal of the Leninist-Stalinist-Maoist approach or the fascist reaction growing out of capitalist societyÖ. The LED feels that the anti-authoritarian movement can be more effective. We can learn from others. We can put our ideas to a test. We can lend each other aid. We can do all this and still maintain individual and group autonomy. But we need efficient communication. Thus we are launching SYNTHESIS as a newsletter to provide this communication among groups and individuals. During this time Long began attending meetings of the North American Bioregional Congress (NABC) and by 1986 SYNTHESIS was subtitled “A Newsletter and Journal for Social Ecology, Deep Ecology and Bioregionalism,” reflecting the breadth of Green political thought developing at the time. In those years SYNTHESIS began covering the meetings of the NABC and the Green Committees of Correspondence (GCoC), a pre-party forerunner of todayís Green Party of the United States. 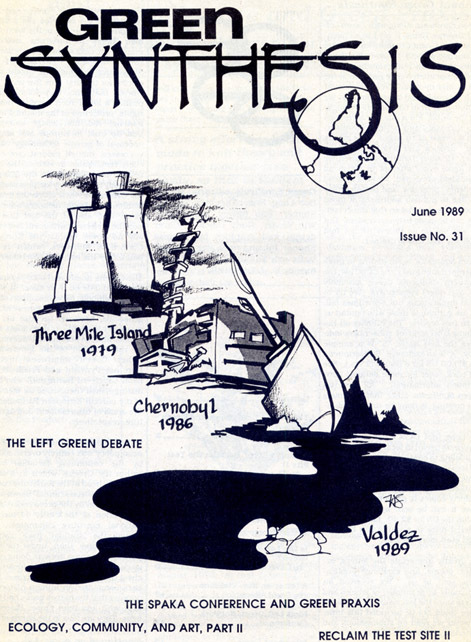 In October 1988 SYNTHESIS changed its name to Green Synthesis and was established as the official GCoC debate/theoretical journal, to go along with the official GCoC newsletter, In Search of Greener Times out of San Francisco. Green Synthesis published many views on the social ecology/deep ecology and party/movement debates of the time, and printed reviews of the important new Green books, all providing a pre-internet, commonly-shared place for U.S. Greens to conduct a national dialogue. When the Green Party of California was founded in 1990, it was in the pages of Green Synthesis that it was announced and debated. In 1992 Green Synthesis merged with the St. Louis-based Gateway Green Alliance’s journal Regeneration and became Synthesis/Regeneration, an independent journal purchased for its members by the then year-old Greens/Green Party USA, which had emerged from the GCoC. Long also made an impact on the airwaves. Starting in 1985, He joined with Southern California Greens Mindy Lorenz (Ventura) and Vince Ivory (Los Angeles) to form the Green Radio Collective on Pacifica radio station KPFK in Los Angeles. They co-hosted “Green Perspectives,” a bi-monthly half hour program that featured state, national, and international Green thinkers and activists, providing one of the first widespread media vehicles for publicizing the Green movement in the country. In later years Bob was joined by Mike Feinstein, Nancy Pearlman and Triana Silton as co-hosts. In 1988 Long founded the South Bay/Harbor Greens and together with other GCoC locals in Los Angeles, Orange and Ventura counties, formed the Southern California Green Assembly (SCGA). The SCGA was a region within the GCoC (this was before state Green parties existed) and provided a vehicle for Greens throughout Southern California to meet. Longís home in San Pedro was one such place that they would meet. Located on a steep hillside with a beautiful view of the bay, the small, two-level house was both a meeting place and Green literature archive inside, and an oasis of exotic gardening and greenery outside. Bob and Helen had orange, lemon, fig, persimmon, avocado, sapote, and cherimoya trees, and kiwi vines which produced about 2,000 kiwis each year. They also raised tomatoes, lima beans, cucumbers, and lettuce, and often greeted meeting guests with fresh fruits and vegetables to take home. Long did a workshop at the October 1988 Greening of the West conference in Jones Gulch, CA that featured numerous Green movement figures and drew over 1,000 people. The following year he attended the June 1989 national Greens Gathering ’89 in Eugene, Oregon, where California Greens met in an organized meeting for the first time. That meeting chose Long and a few others to organize a follow-up in Fresno in November 1989 where coordination on statewide issues and possible formation of a state Green party would be discussed, which led to the partyís founding meeting a few months later in February 1990. Long was an advocate of this strategy, arguing that the global ecological crisis demanded bold action. During the early to mid 1990s Long also continued to attend annual national Green Gatherings, often with his tape recorder in hand, making the only audio recordings from some of them that exist today. Born on March 14, 1917, Long lived his long life to the utmost. A scrappy individual who never let obstacles deter him from achieving his goals, he rode his bicycle when he was 17 about 200 miles from his home to attend Indiana State Teacher’s College in the middle of the Great Depression. Even though he was the first of his family to even attend a four-year college, he went on to get a Ph.D. in chemistry from the University of California, Berkeley, in the summer before World War II. Bob and Helen lived in San Pedro for more than 42 years. Their last eight-and-a-half they spent in Santa Fe, NM, to be near their daughter Kathy and her husband Brad. Bob and Helen were very proud to attend the swearing-in ceremony for Kathy as a new Santa Fe County Commissioner a year ago. In his youth and up to the last year of his life, Long was an avid observer of nature and photographer, with a love of hiking and animals. One of his greatest pleasures at the end of his life was to feed and watch the birds in his back yard, particularly the blue jays. Every morning, he would call out, “Jay, Jay!” and his feathered friends would come for their ration of peanuts.